The following screenshots and impressions were created during the Destiny Alpha phase, and may not reflect final game decisions. The game enters its beta phase on July 17th, 2014. I won’t go into detail about the way the Halo franchise changed video games. I’m assuming anyone reading this who has even a passing knowledge of video game history probably noticed it. Keeping it to a minimum, Halo redefined online multiplayer, paving the way for first-person-shooters for years to come. On the campaign front, it didn’t have the most original story (which isn’t to say it had the most unoriginal story either; the game was perfectly average in that department). Behind the first three Halo games was a studio called Bungie. Bungie wasn’t new to the video game world, and while they saw moderate success in games like Marathon and Oni, it was Halo that established the studio as one of the most prominent developers in the industry. Bungie’s work on Halo would end with a game called Halo: Reach, a prequel to the series. Some fans of the series found the changes to Halo: Reach’s multiplayer unwelcome. I don’t hate it, but it’s a different experience from Halo 3. With that said, Reach is my favorite game in the series for its campaign. Creating my own Spartan made the story a lot more personal, and the emotional impact of the game is present from the beginning: The first Halo game begins with the human race becoming nearly extinct. Halo: Reach takes place before that. You know from the gate it isn’t going to end well, yet every comrade who falls along the way takes its toll on you as a player, until that final moment when you provide cover fire so the humans, along with one Master Chief, can escape Reach. A post-credits scene puts you in control of your Spartan one last time, and ends only when your health is depleted and you’re overcome by enemy forces. I found Halo: Reach impressive in terms of graphics and story, with a solid multiplayer component as its backbone. After Reach, Bungie could’ve done a lot of things. For a long time, fans of the studio waited to see what they would come up with next. After a few years of little to go on besides industry leaks, Bungie’s next game was revealed in 2013: Destiny. For a lot of us, having Bungie behind the game is the only hype we need. Others aren’t so easily convinced, and early screenshots and videos showed what almost looks like a Halo skin for Borderlands. That in itself isn’t a terrible premise for a game, but compared to Halo, it was hard to see Destiny as an industry-changing juggernaut. 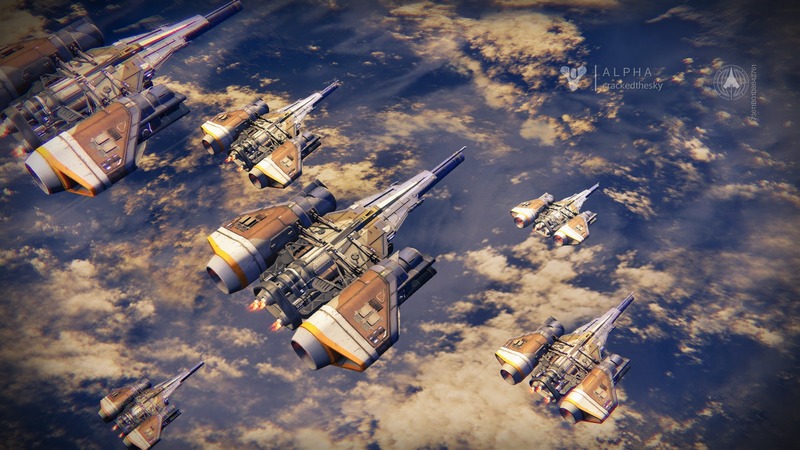 That changed during E3 2014, when Bungie unveiled a pre-release Alpha phase, inviting PS4 owners to play a small part of the game before the upcoming Beta phase. Anyone with a PS4 could sign up, and I made sure I was among them. “It’s just a game,” I thought over and over again in the days before I received my invite via email. On the one hand, what if it sucked? If the game were terrible, it would easily become the biggest flop in video game history. But what if Bungie really could pull another Halo? The pre-release information on Destiny sure made this seem possible. Bungie promised a world in which single-player and multi-player aren’t two incompatible selections on a main menu, but a perfectly blended media through which an epic work of science fiction would be told. But promises are wind; I was told I could step on a flower in Fable and it would butterfly-effect my entire game, I was told I could approach anyone in Skyrim and ask them to go on a quest with me. Neither ended up being true, and those things seem easy compared to what Bungie had promised with Destiny. I signed in. I created a character. I wished there were more customization options; it seemed like I had a choice between five or six faces and maybe ten hairstyles I was willing to use. The only customizable part of your Guardian is their head. You can pick a gender and one of three species, and change those parts of the head I mentioned, but it’s all but in vain: Your character will almost always be wearing a helmet. Some customization in terms of body size and proportions would’ve added to the immersion. But this is all superficial, a tiny part of the game. 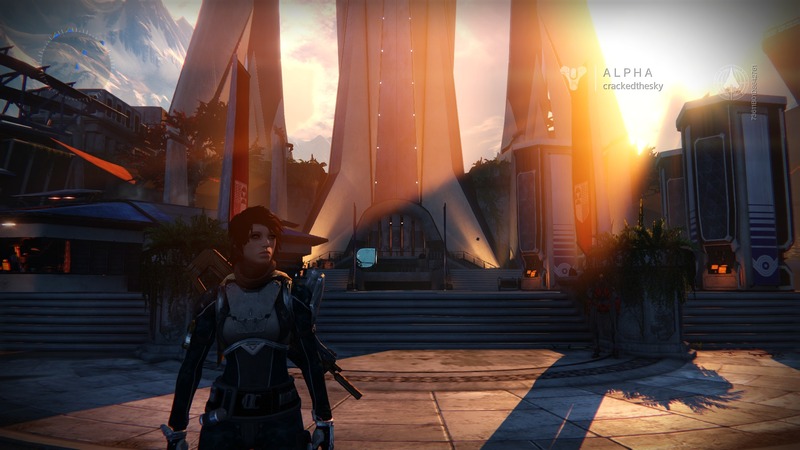 The Destiny Alpha threw me right into the story, on what I surmise is chapter 3. Out of how many, who knows. I was dropped into a map many times larger than the largest Halo map, my Ghost (a robotic companion voiced by Peter Dinklage) gave me a few clues on what to do, and then I was on my own. The game’s layout and style will be immediately familiar to fans of Halo. Well, not quite. Two other people were dropped into the world right next to me. The three of us set off, unfortunately in different directions. This is likely to become one of the biggest criticisms of the game, I think. Much of the game revolves around the idea of forming teams of three players, but unless you’re playing with friends or get matched with people willing to cooperate, you might as well be playing alone. Not that playing alone detracts from the game. It certainly didn’t for me. It was always interesting to be exploring on my own and run across another person (or several) who were engaged in a fierce battle, drop what I was doing and help out, and then go on my way. It’s also nice when you’re in a pinch, expecting to be taken out any second, and then three or four Guardians show up out of nowhere and turn the tide of battle. Exploration was fun. There are always things to do, whether it’s fight enemies, collect items from the environment (there was only one type of collectible I noticed, I’m hoping there are more in the final build of the game), or just summon your vehicle (which could use a more specific name, in my opinion) and ride around the terrain. This story mission offers only a peek into what’s going on: There are two factions of aliens fighting each other and you. As a Guardian, your job is to defend the last living humans. The story has a lot of potential, and Bungie appears to have circumvented one of the biggest problems you’ll find in gaming. When a game mixes single-player and multi-player elements, it’s difficult for any player to feel special. There are games like those from Bethesda, where your character is special and no other human-controlled player ever enters your game. There are others like Pokemon, where your character is special and you can play with others only in a select mode in which they’re little more than passing strangers, a step above NPCs. Then there are games where you play with as many people as you want and nobody is special, or NPCs refer to you as though you are when you’re really not; there are a thousand other “chosen ones” running around next to you. In Destiny, there isn’t just one Guardian. There are many of them, so the presence of other players makes sense. When you enter an area that would make your character unique, the game un-loads other players. They see cinemas and events on their screen, but they don’t see you, and vice versa. This makes you feel like you’re not alone in the world, but that your character is actually a person experiencing things other people aren’t. It’s very interesting, and I’m excited to see just how crazy the story gets. The game itself is immediately familiar to anyone who has played Halo. That “Borderlands with a Halo skin” analogy works to an extent, but only insomuch as the game’s controls. I never felt like I was playing Halo or Borderlands; it was clear I was playing something new. Something else stood out from the beginning, this one negative. It’s almost hard for me to type this, but Peter Dinklage’s voice acting is… sub-par. It’s actually shocking. I love the guy on Game of Thrones, and I know he can voice act, so I don’t know what’s going on. I keep hoping there’s some logical reason behind how bored he sounds (he is, after all, playing a robot; but there’s monotone robotic voice, and then there’s actor-is-half-asleep voice, and Destiny very abrasively has the latter). There are a few possibilities. I was dropped into the game on chapter three, so maybe the beginning offers some kind of explanation for the droning, unexcited tones Ghost speaks in. It’s also the Alpha build, and the playable part of the game was shown over a year ago, so it could also be a sort of rough draft. There is also the possibility that Dinklage, his voice director, or some combination of people involved just plain dropped the ball. In the end it’s no dealbreaker, but I was very excited to play through an entire game with Dinklage’s inimitable voice accompanying me, and the Alpha defeated much of that excitement. UPDATE: After playing the Beta, it’s clear that the Alpha included a very rough version of Ghost’s voice. The Beta includes re-recorded and enhanced vocal effects to give ghost a more mechanical sound. The flat audio from the Alpha appears to have been a deliberate choice after all, and the end result is much better. I’ve left my original complaints in the article to reflect my reaction to the Alpha, but the Beta has very much cleared all of my doubts about this part of the game. Props to Bungie and Peter Dinklage; I love the character already. Once the story mission was finished, I was taken to an overworld menu. Here it’s clear what Bungie is doing in terms of gameplay. You select a planet, then a part of a planet, and then you’re given three choices in missions: Story, Explore, and Strike. Story missions progress the main story behind the game. Exploration drops you into the area and lets you roam, but it’s also full of little blinking boxes that, when found and activated, give you sub-missions, such as defeating a certain type of enemy, scouting an area, or finding supplies. Strike missions are sort of a mix between the two, and require teams of three to complete a more linear series of goals. Aside from those three modes is The Crucible, which is the player-vs-player mode. This will again be familiar to fans of Halo: Two teams compete in deathmatch, capture-the-flag, or various other modes. The Crucible loading screen. Each ship represents a different player on the same team, and while they all appear the same in this screenshot, your ship is customizable and will appear so on such screens. Where it differs from Halo (and just about every other FPS) is that it doesn’t take your things away. You aren’t given a carbon-copied mannequin to play as; you get your Guardian, complete with their armor, weapons, special abilities, everything. This is a concept I’m sure every FPS player has thought about, and one that usually looks better on paper. After all, when you have a game as customizable as Destiny, where each player has different weapons, armor, and abilities, how do you create a fair fight? I can’t answer that, but somehow, Bungie pulled it off. I never felt like I was being overpowered or that I was dominating; almost every match came down to the wire. Neither team was ever far ahead of the other, victory was never squarely in my grasp. The matches were fast-paced and fun. Since I was never sure I was going to win or lose, I found myself not even caring, and just playing the game. I don’t know of any other game that does that for me. 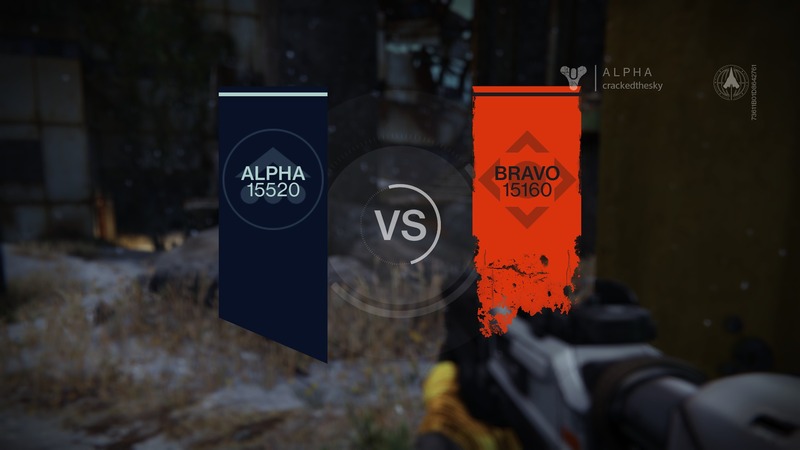 And this is just one PVP mode; there are a handful, but only one was available during the Alpha. A standard PVP results screen. There’s also the Tower, which is the hub of humanity. To my surprise, when you enter the Tower, the game switches to third-person mode. This is the only area (in the Alpha, at least) in which your character doesn’t wear their helmet. The tower, with my character sans helmet in the foreground. The Tower is full of NPCs that run shops, give missions, manage items, and deliver mail. It’s an interesting area, though the third-person controls are a little rusty (think Fallout 3 as compared to Skyrim), and I couldn’t shake the feeling that the Tower is, essentially, a main menu that makes you walk to each selection. 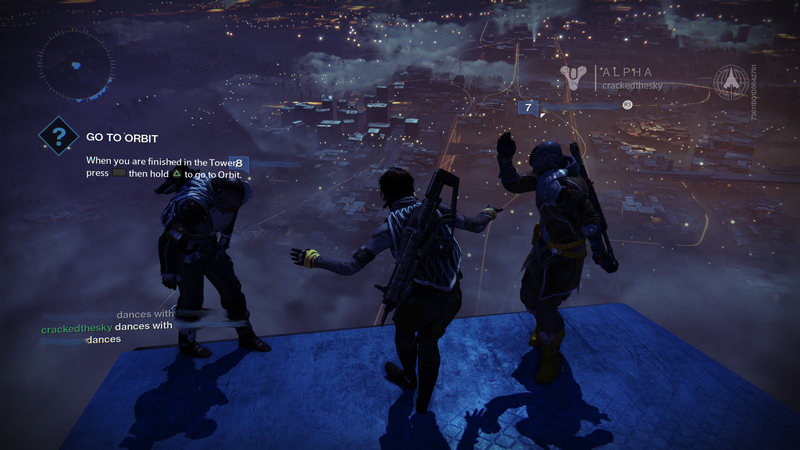 On the flip side of that, other players popped in and out of the Tower, and a few emotions were available, such as waving and dancing. This led to a lot of humorous shenanigans between players, and makes the Tower a worthy addition to the game. At one point I found a guy sitting on the edge of a skyscraper looking out at the Traveler, that iconic gigantic white orb at the core of Destiny’s story. I sat my character next to him, and a third guy joined us. After a little sightseeing, the three of us stood and danced for a while, after which the two of them jumped to their in-game deaths. I don’t think I’ve ever laughed so hard at something in a video game. 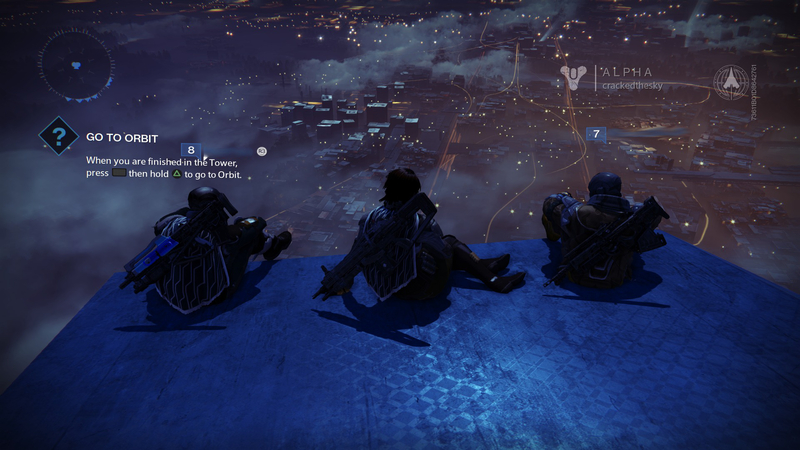 Enjoying a night at the Tower. It’s that inter-personal connectivity that makes Destiny what it is. You’re playing alone and with others at the same time. It’s easy to see why the game took so long to complete; everything just works. Playing the Alpha was everything I thought it would be: It’s like when you’re younger and you have all of these awesome ideas for a video game, and as you get older you realize how impossible it all was, how so many different nuances and elements couldn’t possibly work together. Destiny has the potential to be that game you always wanted to make, and Bungie made it work together. I don’t know how, I don’t want to know. I’ve never played a game like this, and I can’t wait to see the finished product, and what the projected sequels have to offer. 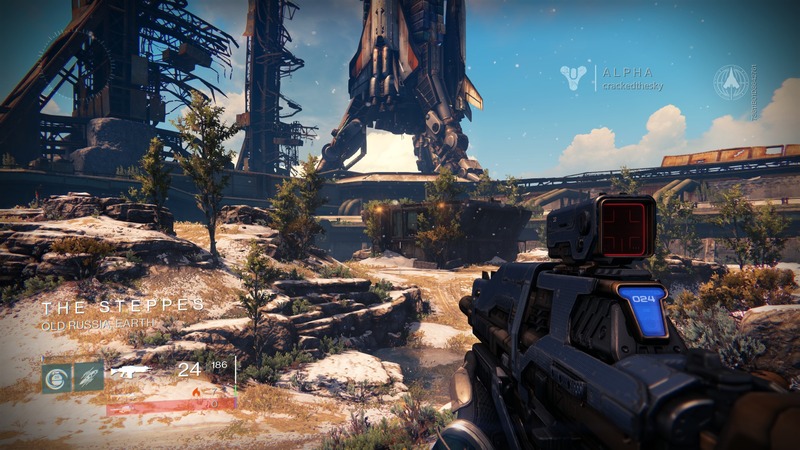 The Destiny beta begins on July 17th for Sony consoles. I play on PS4, where my username is crackedthesky. Feel free to add me and play along in the beta.